I found it difficult to sleep last night, as I was very excited about starting my journey. Today I was up at about 4am. It was so dark outside. Being up so early gave me a chance to enjoy breakfast before my taxi arrived at 5am. The journey to the airport was uneventful. As usual I was there super early. Which I prefer, especially when I have my bike. As it is a bit of an effort to drag around the terminal. Check-in was nice and easy. I also got upgraded to a seat with lots of leg room. Which is great, as it is a 5 hour flight to Perth. The flight was only half full. So it was a nice and quiet. Gave me plenty of time to relax and think about the ride. During the flight I was looking out of the window to the vast open spaces I'm going to be crossing in a few weeks. Looking forward to the ride and camping under the stars. 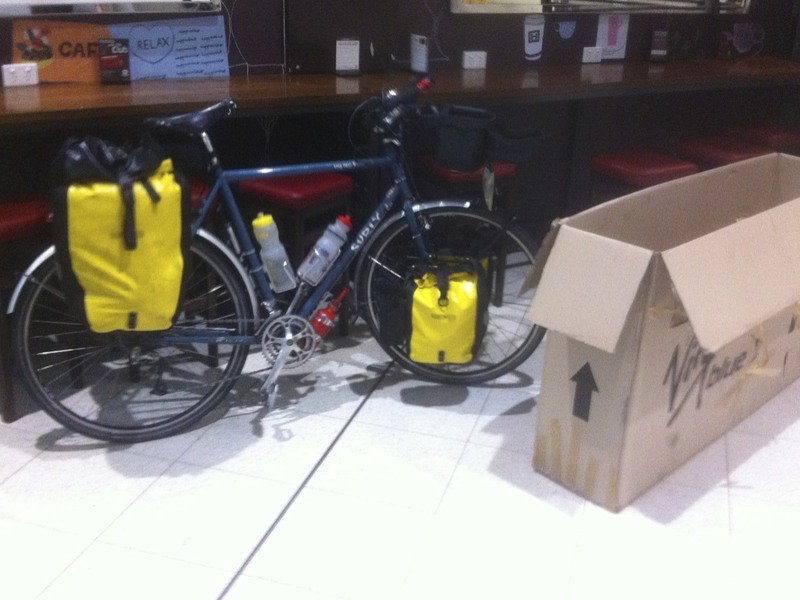 Once I arrived at Perth I had to collect the bike and reassemble her. It is always the most anxious part of my trip. As I'm always thinking is my bike on the plane and is she still in one piece. As if it isn't it kind of makes the tour a bit more of a challenge! Thankfully my bike was waiting for me and all I had to do was put her back together. 45 minutes later I was all set to go. The weather when I left the airport was a beautiful blue sky day with a slight tailwind. Perfect for riding. First thing I needed to do was get some camping gas for my stove. So went to Bunnings and the staff there said they didn't stock it. I was a little surprised, as it isn't a small shop. So I thought I check for myself. I found it in about 2 minutes. After, I followed a bike path which ran alongside the freeway. Such a good path. Didn't need to mix it with the traffic for about 40kms. Along the freeway I took the turn off for Rockingham. As this was going to be my stop for the night. When I got there though the campsite was not very appealing. 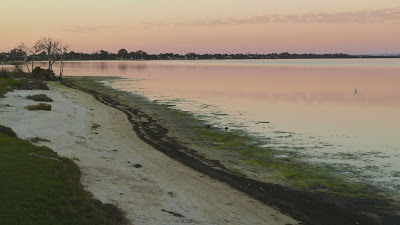 As it was only 2.30pm and the weather was still good I decided to continue through to Mandurah. I arrived at Mandurah just after 4.30pm. It is a pretty town located right on the water. As it was getting late I continued to my campsite for tonight. Decided to stay at the Miami Holiday Park. It is located right next to a lake. I got a spot just near the water. For my first night it is very pretty. I got to enjoy sunset as I was erecting my tent. I was going to cook tonight, but was feeling a little lazy. So opted for fish and chips instead. Which was yummy. I couldn't have asked for better weather today. Plus I had some great cycle paths and quiet roads to enjoy the ride. The only issue is that I like to be camped by about 3pm. But seeing I had a late start today, that's okay. I'm getting tired and going to head off to bed. Can't wait to see sunrise from my tent tomorrow.